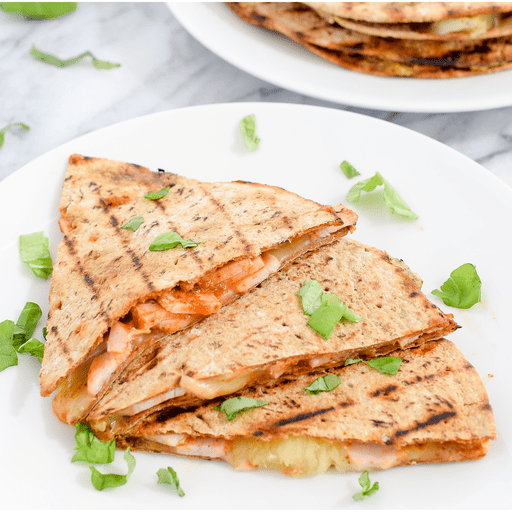 This sweet and savory dish takes traditional Hawaiian pizza ingredients, including pineapple and Canadian bacon, and puts them into a cheesy, quesadilla form. 1. Spread 1 tsp. pesto on each flatbread. Then spread 1 Tbsp. pizza sauce on each flatbread. Place flatbreads in a pre-heated skillet pan on the stove top. 2. Sprinkle ¼ cup of cheese, followed by ¼ of the Canadian bacon and ¼ cup pineapple chunks over one half of each flatbread. As the cheese begins to melt, fold the flatbread in half. Flip once and remove from pan when cheese is melted and all contents are heated through. Top with basil leaves and enjoy! For gluten free: Use gluten free wraps in place of flatbread wraps.